Hmm seems like a nice tremolo. I assume it'd be ok to use any common dual opamp (te072,nr5532,jrc4580,...) for IC1 and IC2 ? Frantone!? Tremolo?! ICL8038!? When does the hurting stop?! But seriously, now I have to get some of these. Do you know of any reason why ICL8038CCPD, in particular, would not work with this? This thing goes from sweet/mellow to damn near VRP chops. Can't wait to build it. They're the ones I bought so they better bloody had do! :o) The circuit was tested with expensive ones from Small Bear and the cheapo ones on eBay and apparently they all worked. My name is Heath.. and I'm an addict. You and me both matey! I'm so glad you posted that. It caused me to check my switch stash and I'm fresh out of on/on/on anything. It's in my mind at the moment because it came up recently in the Fulldrive thread, and I'm sure they'll be people have problems with their build simply due to the fact there is no norm, and both contact configurations may be supplied. So it's a bit of a crap shoot if you don't check. I definitely prefer on/off/on when it comes to layouts and support! Just saw it on DiscoFreq's site. Very nice. Got my 8038`s today so got this built tonight with mixed results. Firstly I`m getting a tremolo effect but only on 1 of the wave settings, as my switch was inverted to the example on the layout I thought I`d screwed up the wiring, triple checked it but it appears correct. If I`m understanding the wiring correctly sw5 is the common and the waveform changes by connecting it to either sw1, sw3 or sw6, sw5 & sw6 give tremolo, sw5 &sw1 or sw3 give unaffected signal. Fast switch gives unaffected signal when the connection between the wires is made but tremolo when the connection is broken. I`ve had a quick look at the schematic and the only thing jumping out at me is it shows pins 6&8 of the 8038 connected to 9v and the layout has only pin 8 connected. Will give it another look tomorrow. If you bought more than one, use your multimeter to see which pole changes state first. yeah the switch is mirrored but I wired accordingly, I`ve even desoldered the switch and connected the common to the individual wires using a crocodile lead and still only working with 5&6 connected. will check my voltages later. only just noticed I`ve put in a 100 uf cap instead of a 1000uf, and no 1watt 10r resistors so used 1/2 watt. 1000uF is overkill IMO, 100u is fine there and 1/2W is fine for the 10R as long as it doesn't burn up. Personally I'd use a 100R there instead of 10R and just stick to 1/4W. How many ICs did you get and did you socket? got 5, yes socketed and tried them all, they seem suspect tho`, only getting 7.2v at pin 8. if I take the chip out I get 9v at pin 8 on the socket. Yes it is peculiar and it's there for everyone to see that 6 is also connected to the supply and looking at the datasheet that's the V+ pin so you would think that connection is compulsory. I've just looked over the PCB and the only thing I can see that is different is that 7K5 in my layout looks more like a 1K5 on the board. Yes... I also noticed that. I tried putting a 1K5 there with and without Pin6. The only thing it did was increase the speed rate. 1) When the Square Wave is selected, the Fast Switch doesn't do anything (but it does work for Sawtooth & Sine). 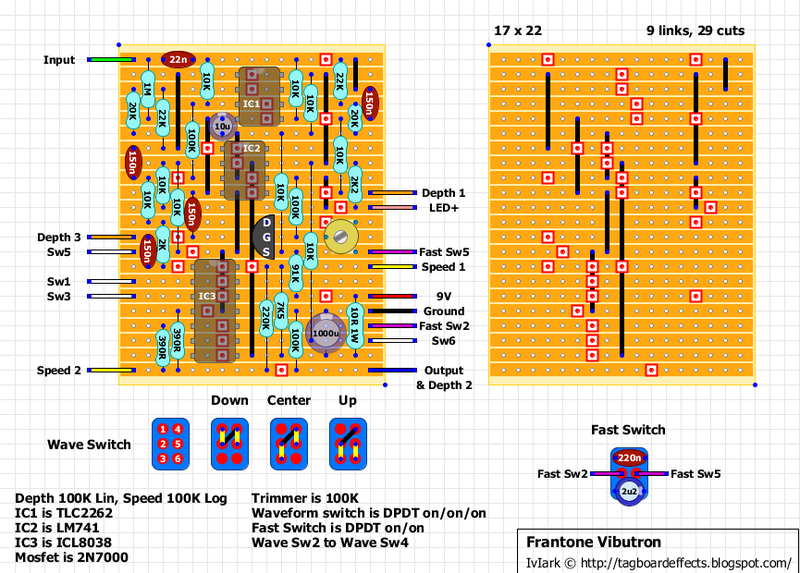 Since the original Vibutron doesn't have a fast switch and never shorts Pins 7 & 8, I'm wondering if it "would" be functional? 2) I can't tell much difference between Sawtooth & Sine except on the higher speeds. However, there is a dramatic difference between Square. I'm not worried too much about Pin6 anymore because I found another project using a ICL8038CCPD and it did not have Pin6 connected either. Well as you say, the Fast switch is an added bonus based on the IC notes rather than the actual Vibutron and so how it works is always going to be a crap shoot. If it doesn't work in some settings then I can live with that because it doesn't matter to the actual circuit. Square is always more extreme, and as the other waveshapes can sound very similar in some settings I reckon that is verified if you concur. Did you think it was better with a 7K5 or 1K5 in there? I concur. To me, it sounds better as is with 7K5 because I like the option of having the slowest speeds available. Using 1K5 does have a benefit though because at the highest speed setting, it gives a metallic, chorus, shimmering sound. On a side note, one thing I accidentally discovered... if you place a jumper from IC3/Pin3 to IC3/Pin9, you get a "pseudo reverse gate" sound. Very different. The downside is you forfeit the Square Wave. OK I'll tag it and add a modded version with a switch to swap the resistors and add the link. It can be an option then. I've built this pedal today using 100uF, 100R 1/4W and 1.5K. It works but the slowest speed is not as slow as you hear in the video. I've double checked values and connections and everything matches the layout. The Peddler said above that the slower speeds weren't available with the 1.5K resistor, so you want to swap it for a 7.5K (or some value around that). I've tried a 7.5K but it didn't get much slower. The slowest speed I get is almost 2/3 if not half of the pedal in the video. I was so amazed at the great sounds that I did not even notice the speed is different from the one in the video clip. After comparing... yes... my build is a bit faster. I'm breadboarding a 2nd one now. Replacing the 7K5 resistor with a different value is too limiting (no range). Replacing the 7K5 resistor with a pot just makes things sound too funky at the Min/Max settings. A 2nd DPDT on/on/on switch with three resistor values might be the cure? I really, REALLY like the jumper option from IC3/Pin3 to IC3/Pin9 and I'm testing different ideas for that as well. I should have more info after the weekend. For those interested, I have uploaded a video clip of current breadboard tests for the Vibutron w/7K5 resistor. The audio track has Sine/Triangle/Square with Slow/Medium speeds. The new Pseudo Reverse Gate Effect is towards the end. I don’t have a video camera so I just added some random images as filler. Fantastic! THANKS! That's the missing puzzle piece for me. I substituted a 1uF for the 220n and it's really S L O W now. The Fast switch has no effect now but that's beside the point because it can still function as a Fast switch by using the old 220n in it's place. Does that make sense? Maybe use the Fast switch to select between a 1uF and a 220n. Still testing. Must get sleep sometime... Geez! After some more tinkering, I decided to go with 2uF on the Fast Switch. I used two 1uF in parallel and that provides a complete range of speeds from insanely slow to maniacally fast. So, the layout that we have now is working? Or does it need to be fixed in some way? Thank you for all the effort! So do we still leave out the 7k5 resistor. Also speed 3 to ground, empty ...? I couldn't find any lm741's, would a tl071 work in there instead? In the layout by that 3 spot jumper it shows the cut in to 2 different places on the blank board and the populated board. It doesn't look like the cut would effect anything, but it made me go cross-eyed when i was trying to populate the board :) Thanks for your help! The world conspired against me on this build. I had to go over it several times and found a personal mistake every time, but everything is working right now, and it is an amazing temolo. After getting it all squared away, I thought I only had one working setting on the waveform switch, but after dialing in the 100k trimpot, they're all there. You guys are awesome! I rebuilt it from scratch and will try again today...i also tried wiring the on on on switch accordingly because it is mirrored...also tried every combination, nothing made it tremolo...But comparing it to my previous build it looks identical...so either a component was faulty that does not "take" the guitar signal and tremolo it, or I dunno. (i checked the traces, cut in between the traces for solder bridges...etc) But as i said, the LFO was working , so my guess is that it is a faulty component. This is starting to get ridiculous...never should have doubted myself. IT does exactly like the first build..exactly, the LFO tick is heard, all the knobs do something, the switches modifies the speed/signal accordingly in the ticking...but still a dry sound. Am i missing something? It's clear to me now that i did nothing wrong at the circuit,because it is identical, and i made it with a fresh start alltogether. I still get a slight LFO tick but only when selecting square wave. Of all my pedal builds, this is probably my favorite one. Incredible sounds! After building it, I've spent all my available peddle-building-time working out some mods for this one including different waveform outputs. Stay tuned. Hey, could you please give me some pointers what to do with my build? Built it TWICE from scratch a second time around...nothing works,as the first time. I've wrote something a few posts up maybe that is enlighting. Tnx! thanks Peddler , ill try through those. Razvan ... i had the same till i adjusted the trim pot ..then all the effect(wet) came alive. Hmm, i tried fiddling with it in both builds, it does something, but still no "wet". I have a theory: could it be the fact that(out of curiosity i measured the trimpot, it's the most common cheapo blue/white combination trimpot), the trimpot has 82-88-89k max, and maybe, just maybe, the sweet spot would need let's say an exact 100K measured trimpot, maybe that works ast 92-95K exactly...since mine is just 82-88K to start with, the values are"not there". Could this be it? hey , thanks peddler ..went through yr check list .n got it going but in a diff way . then between various tries to reduce clicks ... i put an led from IC3 Pin 9 ..and the clicking is negligible .. sounds great and useable now. also shows the tempo in blinks...ofcourse that kills the Sq wave. so i setup a rotary switch such that on Sq wave the the led goes off ...it clicks but on Sq wave its harder to hear ..
last check tomo with other pedals in chain ..mainly gain type ..
During the rebuild whle trying other ICs i noticed the ticking is on from 8038 even without any other Ic present on board replaced the 8038 and still same .. maybe IC is iffy..? razvan .. my trim is set about 85 depending how measure ..and the pot reads 97k total. Thanks for the reply...Unfortunately, that did not solve anything. The LFO is present,etc...ticking. Still a dry sound.Oh well, I'll let this one go and that's it. Will build another one for the man. Thanks. Thanks for the reply IvIark. I have dropped the project altogether and talked with the person to build another trem model, which worked as always, from the first try ...oh well :) Thanks anyway! update...the trem still had a clicking even after the last changes...soft but audible when amplified loud ..
i found removing the 10k between IC3 pin9 and IC2 pin 7 helped a lot..not sure what the resistor was for but it didnt change the sound or functions .. if anyone can explain its purpose please..
then a 4.7u cap frm IC3 Pin 9 to Gnd absolutely removed the clicking ,, even on sq wave and the rev gate effect... found no loss of highs in the tone. keeping it this way for now. 2 new things i added ..
1 taking the tempo led source form ic2 pin 6 gives u tempo and waveform as the led swells and dips .. even the rev gate . IT is INV of audio signal but works. 2 to get the max out of each waveform i used 3 VR s- 100k each, through the rotary switch ( wave select switch) to set each to where they respond best. gives better response to the sq wave . I'm really looking forward to get rid of that clicking sound and those fine tune pots look like a good mix. yeah .. do let kno how it turns out. u may need a smaller cap , i went up in capacitance till the ticking was gone n i believe in your make its softer as it only shows on Sq. wave. hi all ..aft a lovely 2 months with this pedal its suddenly beginning to distort the signal if i play a chord or even 2 notes together .. like input overload .. i have a audio probe .. n found the signal clean till the 2n7000.. and breaking up aft . have replaced al IC s and mosfet . I have the same problem from the beginning. Used a scope to check the waveforms and they are good. As usual for this chip, the square is much higher amplitude than the sine or triangle. Interestingly, the square does not seem to distort the audio signal, probably since it is just turning the MOSFET on or off. If I drop the bias on the MOSFET to shut it off, the guitar signal going through both halves of !C1 is equally clean. Everything works exactly like it is supposed to except for some distortion with the sine or triangle driving the MOSFET. I also replaced the MOSFET and hear no improvement. The breakup is not to bad when the blend pot is less than halfway, but is quite noticeable when more of the vibrato signal is present. Since the MOSFET is just acting as a variable shunt to ground I find this confusing. The MOSFET has to be injecting the distortion. Never had any ticking or other problems. Any idea of what could be wrong? but... as far as i can see it seems like switching will be SW5 to SW1, SW5 to SW3 and SW5 to SW6 or am i wrong? leg 2, 3 and 9 on IC. I had a bit of a job getting this one going (wired the switch incorrectly first time round). The square wave sounds good but the other settings have virtually no effect whatsoever, any hints?